In the past few decades Tarot has evolved to share many characteristics with post-modern art. So, what’s Po Mo about Tarot? The basic premise of post-modernism is…….. There are no fixed meanings. Meaning depends on context and on what the reader brings to the text or image. There is no “right” way to interpret a card. Instead of memorizing given meanings from a book, the reader engages the card image directly and allows the card to reveal itself. 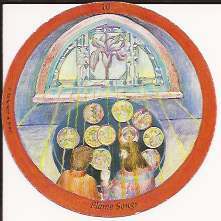 Card meanings are fluid and change with the surrounding cards, the question and the context. Personal interpretation takes precedence over authorities, even the deck’s designer. 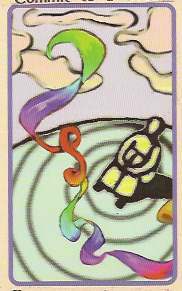 Until the 1970s, how-to-read-Tarot books spoon fed the “correct” card meaning. 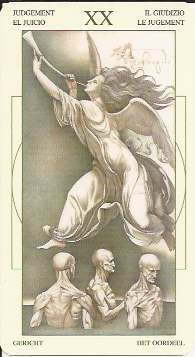 Compare this to Mary Greer’s groundbreaking 1984 workbook, Tarot for Yourself, which guided the reader through the process of developing a personal relationship to the cards. Instead of interpreting a spread in a one-way flow of information, the reader helps the client draw his/her own meaning from of the spread. The Tarot reader, no matter how experienced or well-informed, does not presume to know better than the client how to apply the cards to the client’s life. Richard Roberts demonstrated this technique in his 1971 book of transcribed readings, Tarot and You, which influenced Mary Greer. A friend of Joseph Campbell and a devotee of Carl Jung, he wrote that the success of a reading depends on the reader’s level of consciousness and personal development rather than on knowledge of card meanings. Although his intention was to encourage the client to come to his own conclusions, in practice he jumped in and interpreted the card before allowing his client to speak. Clients usually ended up agreeing with him, perhaps because they didn’t want to contradict an authority figure. 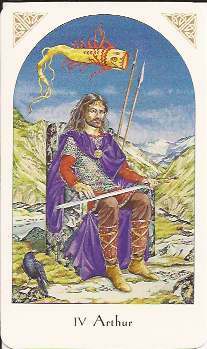 It took a psychologist who uses Tarot to implement Robert’s intention and give truly interactive readings. 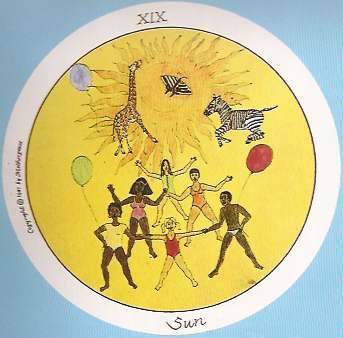 In his book Tarot and Psychology, Arthur Rosengarten gives some very moving examples of how Tarot imagery, with minimal or no interpretation from him, caused dramatic shifts in his clients’ understanding of their situation. Like repackaging a ’50s sit com or doing a cover of a Beatle’s song, deck designers endlessly repackage the Rider Waite Smith deck, tweaking it to appeal to various interest groups from Gays to Goths to Druids, while keeping its essential form. Playing cards and fortune-telling are considered “low culture.” Decks done in the style of Old Masters like Da Vinci, Bosch, and Botticelli thumb their noses at these cultural distinctions. Conversely, decks illustrated in comic book and Manga style glorify pop culture in a medium that many believe is intended to convey spiritual truths. Collage was first used in fine art by Picasso and Braque about 1903. The first collaged deck to reach the mass market may be Penny Slinger’s Secret Daikini Oracle of 1976 (also known as the Tantric Tarot). 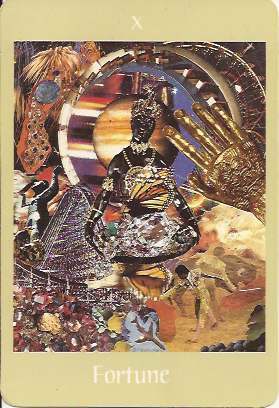 The Voyager Tarot by James Wanless is the ultimate in fragmentation. Each card is a conglomeration of images centered on the card’s theme. Kat Black (Golden Tarot and Touchstone Tarot) takes fragments of old master paintings out of context and blends them seamlessly to create an entirely new entity that has no relation to the original masterpieces. The ultimate post modern deck may be the Housewives Tarot by Paul Kepple and Jude Buffum. 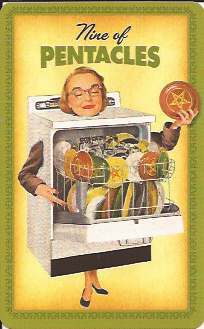 Ads from women’s magazines of the 1950s are appropriated, collaged and used in an entirely new context, while parodying the image of the happy housewife swooning over her new Maytag dishwasher. When art is liberated from having to convey meaning, surface beauty becomes paramount. Decks become gorgeous while meaning is secondary. In the late 60s and early 70s, authors prominent in the witchcraft community like Sybil Leek, Leo Martello, Paul Huson, and Arnold and Patricia Crowther, published books linking tarot and the Craft. Witchy decks didn’t appear until the 1980s. Among the first are the Barbara Walker Tarot published by U.S. Games, Inc 1986, and the Witches Tarot by Ellen Cannon Reed & Martin Cannon published by Llewellyn in 1989. In the late 1970s, several members of a Santa Cruz, California women’s circle experienced an outburst of creative activity that resulted in numerous goddess- and woman-oriented decks. Some names that appear on multiple decks are Flash Silvermoon, Billie Potts, Shekinah Mountainwater and Ffiona Morgan. Most of these decks were self-published or had a very small print run. The first mass market feminist/goddess deck was Motherpeace, created in 1978 by Vicky Noble, Karen Vogel and Lily Hillwomyn, self-published in 1981, then published by U.S. Games, Inc. in 1983. The first book to take a feminist approach to Tarot appeared in 1976: A Feminist Tarot by Gearhart & Rennie. This was not a radical re-visioning of Tarot but rather a transitional book reinterpreting the Rider Waite Smith deck with a feminist slant. The late 20th century saw the creation of decks for every lifestyle, from gays to goths to pagans. Dead White Males and European sensibilities were dethroned as the default viewpoint. Decks based on various world mythologies and cultures flourished. 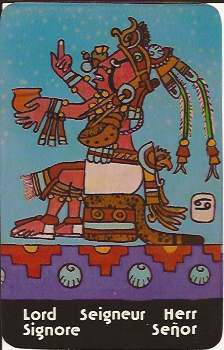 The Xultun Tarot published in 1976 by Peter Balin is probably the first deck based on a non-European culture. Predicting the future means extrapolating from the present; yet culture-changing technology often comes out of left field rendering models of the future laughably outdated. Unforeseen innovations will transform Tarot in ways we can’t predict. But here’s a list of trends that will probably continue for the foreseeable future. As self-publishing technology becomes more accessible we’ll see more small editions of artist’s decks expressing a personal vision. The collecting mania will not abate. Demand will be met by self-published decks and publishing houses like Lo Scarabeo that commission artists to create decks. Tarot will be more global and more fragmented at same time. Computer technology will allow individuals to express their personal symbolism in Tarot, and the same technology will allow artists to market their self-published decks globally. The Rider Waite Smith deck is entrenched as the default deck in England and North America for the time being due to the sheer number of decks that use it as a template, and the how-to-read books based on these decks. The interactive reading style facilitated by fully illustrated decks is infiltrating regions like Latin America and France that have very different tarot traditions. 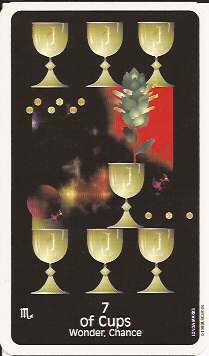 People who combine tarot with a special interest such as Kabbalah, Cathars, or the Grail legend (as well as hard-core historians who don’t accept anything without airtight documentation) are finding each other on the internet and forming their own informal special-interest groups. Tarot will increasingly be used for spell work, talismans, guided visualizations, and creative inspiration. Readings will become just one of many uses for Tarot. Tarot will become more professionalized. Perhaps it will go in direction of astrology with professional associations, schools, degree programs, and international conferences attended by hundreds. Each one of us influences Tarot’s future with the decks and books we buy, our blog postings, and the conferences and classes we choose to attend. We have inherited an ancient, flourishing tradition. What part of your tarot inheritance do you want to preserve? What future are you creating for Tarot?